Your pet will crave these crunchy, delicious, guilt-free snack treats. Puffsters are 100% made in the USA. At less than 10 calories per treat, Puffsters make the perfect training treat or any-time snack. 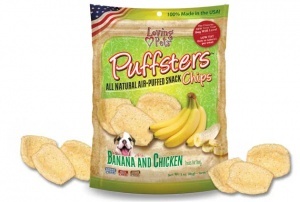 Each bag of Puffsters is foil-lined and zip-sealed for freshness, with more than 50 treats per bag! Made using 100% all natural chicken and banana, they will keep your dog fit, healthy and satisfied. Tapioca Starch, Potato Flour, Wheat Flour, Banana Powder, Chicken, Rice Bran Oil, Carob Bean Gum, Salt.